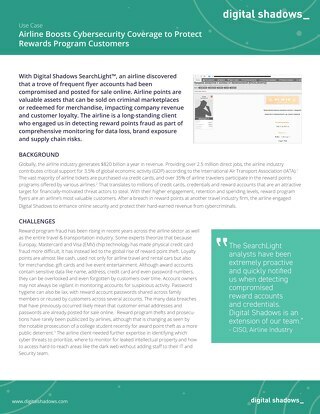 Digital Shadows helped an IT manager of a large technology company discover a significant amount of their source code - including their credentials for their administrator - on a public site. 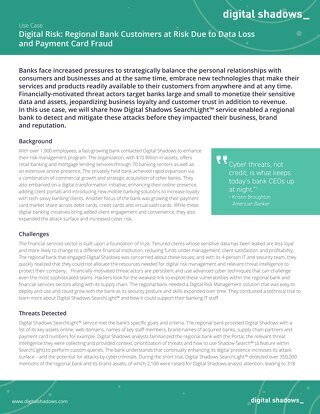 In this use case, we will share how our services enabled a regional bank to detect and mitigate these attacks before they impacted their business, brand and reputation. 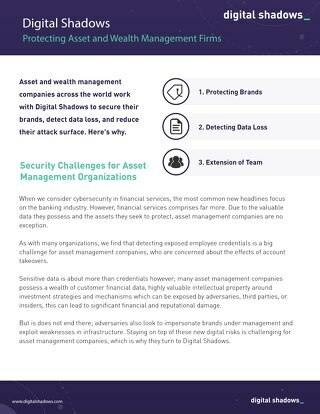 An IT manager of a multinational financial services holding company involved in Investment Banking, Private Banking, and Asset Management discovered a phishing site impersonating their brand. 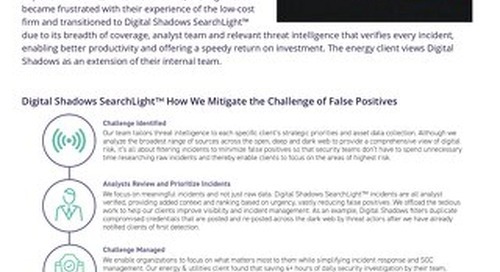 Digital Shadows client received an email from a known attack group demanding a large sum of money to prevent a denial-of-service attack on their website. 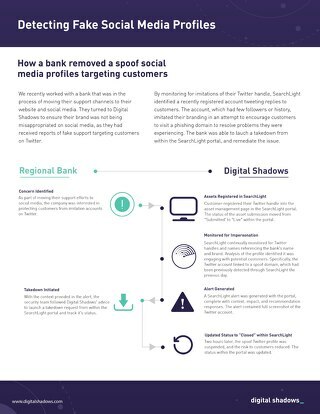 Digital Shadows helped the SOC Manager of a retail bank discover that customer credit card numbers were being shared on IRC channels. Digital Shadows helps the security manager of a bank discover that they had been named on the target list of a hacktivist operation's latest phase. 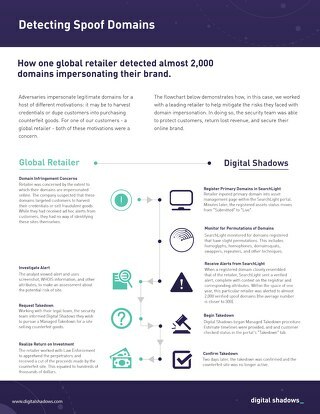 Digital Shadows helped a regional law firm discover key employee details exposed online for its Chief Counsel - including family names and home addresses. 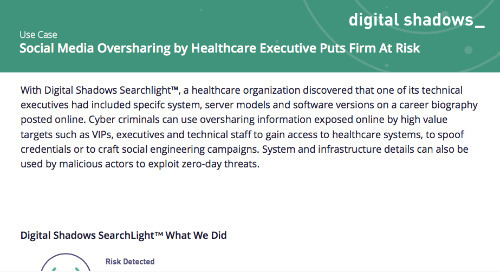 Digital Shadows helped a healthcare organization discover that one of its technical executives had included specific system, server models, and software versions on a career biography posted online. 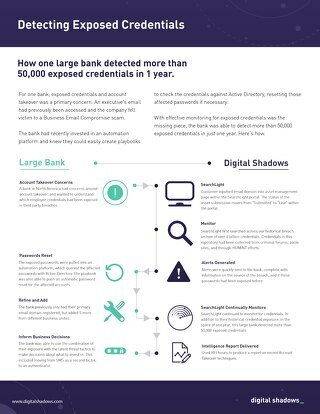 Digital Shadows helps the IT security manager of a bank discover a configuration file that indicated a banking trojan was targeting their customers. 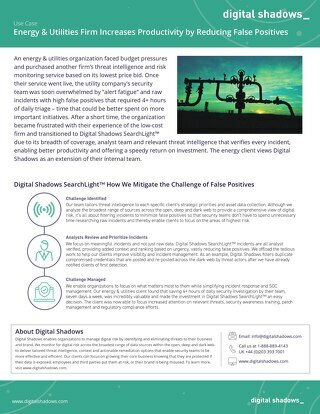 Digital Shadows helped a manufacturing firm discover that a third party contractor exposed sensitive Non Disclosure Agreements signed by its customers via NAS (network addressed storage).